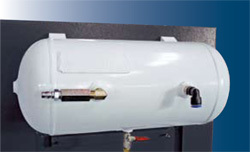 The one-piece construction base with modular box design and optimum support maintains the machining accuracy. The construction base with optimum rigidity support design is proved by ultimate analysis that can guarantee maximum loading on worktable and heavy-duty cutting. The spindle position is designed with symmetrical to center that provides stability of temperature level. 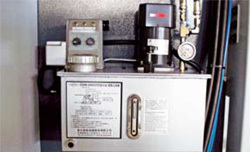 Moreover, the short transmission system design reduces the heat conduction and extends the machine's life expectancy. X-axis and Y-axis is adopted THK linear roller guide ways. 35-HP spindle motor, 6,000 RPM two-steps automatic change gear box. Output torque of 642Nm(ZF gear box), offers capability of low-speed heavy cutting and high-speed precision cutting with extensive process range. (For demand of higher torque, please contact with our sales department). The Max. cutter diameter is 125mm & the cutter length is 300mm. Advantage of direct transmission leads that the leadscrew can rotate with no influence from belt tention. Direct transmission with speed-reduction mechanism is added to X-axis to increase the transmission torque, the thrust, and the capacity for workpiece weight. Z-axis is adopted oil pressure balance system and building in pressure saver which supports smooth and stability for acting in Z-axis. These three axis motors are adopted direct driven design that provides no back interstices as well as increases the machining efficiency and accuracy. Our head construction has been assayed by ultimate analysis. The strengthened head construction design can reduce deformation risk during machining. The ball screw rotates with no influence from belt tenson. 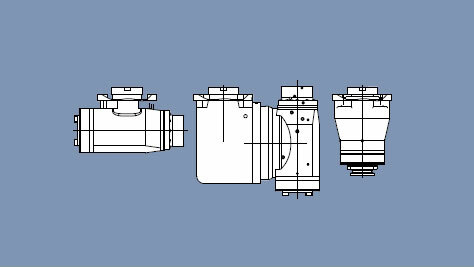 The responses of the motor are directly sent to the ball screw. The positioning accuracy is excellent. The torque and the thrust forces are increased. *Y-axis gantry adopts modular box-type girdle rip design with the high span linear guide ways supporting. 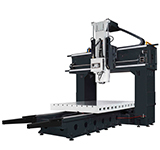 The wide Y-axis design is suitable for big workpiece and chips collection. 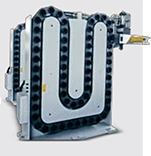 Y-axis is adopted modular box girdle construction design with the high span linear guide ways supporting. Therefore, the wide Y-axis is suitable for big items cutting and chips collection. One-piece construction design is Amga's persist in design concept. 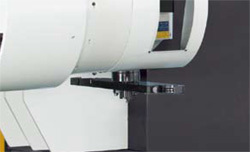 High-stability body provides capability for higher accuracy machining. It is not only able to carry a heavy workpiece, but also to perform heavy cutting with the highest-level accuracy in industry. The thermal deformation compensation system includes measurement of thermal deformation, thermal deformation math model developed based on the measured thermal deformation, and compensation card that executes the compensation process. It enhances machining accuracy, solves thermal deformation problem, and increases the cutting accuracy. 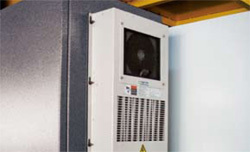 Overcome the influence of ambient temperature. Suitable for long machining hours with same accuracy for mold making. 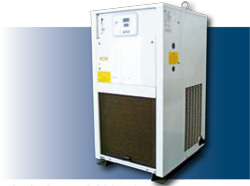 The machine can work anytime, no need to warm up the machine in advance. The gear-driven spindle provides spindle speed of 4,000rpm and 6,000rpm with high output torque which is the best choice for frequent heavy-cutting operations. ZF spindle has higher torgue than belt-driven spindle. 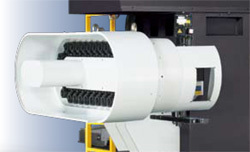 ZF spindle provides higher rotational speed than gear driven does. ZF gear box has 1:4 speed reduction ratio mechanism. It enlarges output torque by 4 times. It offers an extra choice for users who needs high rotation speed and high torque for machining operation. Spindle speed:6,000rpm. 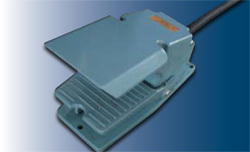 BT-50 taper adopts short spindle end design with use of gear box. This is suitable for heavy cutting. Spindle torque could reach 572Nm, and 8,000rpm spindle is available. 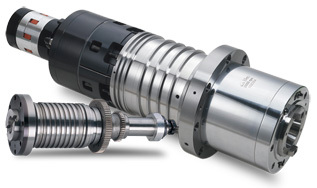 The design of the extended long-end spindle is especially suitable for deep hole machining. 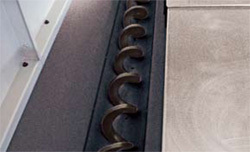 BT-50 inside hole taper and 6,000rpm spindle are standard design. 8,000 rpm spindle is available. It is very suitable for large mold machining. The ultimate analysis illustrates the high rigidity construction design is optimum to restrain vibration and maintain stability of machining. The united high-precision spindle is adopted the ball bearing support design that can well endure vibration of machining. Spindle is adopted floating oil pressure tool clamp design. Auto 90 degree head warehuse beside ATC Auto 90 degree head warehouse on table Semi Auto 90 degree head warehouse by swivel arm 60 VERTICAL HORIZONTAL ATC.